CDK 1.5.10 has been released and is available from sourceforge (download here) and the Maven central repository (XML 1). The short release notes (1.5.10-Release-Notes) summarise and detail the changes. Other than the availability in the central repository the release includes a new MolecularFormulaGenerator contributed by Tomáš Pluskal that provide mass to formula generation in a fraction of the time of the old MassToFormulaTool. CDK 1.5.9 has been released and is available from sourceforge (download here) and the EBI maven repo (XML 1). This is the first release to be built using Java 7 and will require the Java SE Runtime 7 to execute. The previous release (1.5.8) will be the last to work with Java SE 6. The full release notes (1.5.9-Release-Notes) summarise and detail the changes. One of the new features is the recognition of perspective projection stereochemistry. This post follows up on the previous to report some timings. I've checked all the code into GitHub (johnmay/efficient-bits/fp-idx) and it has some stand alone programs that can be run from the command line. Only generation of the CDK ECFP4 is supported and at a folded length of 1024, this should give a close approximation to what Matt used in MongoDB (RDKit Morgan FP). Other fingerprints and foldings could be used but the generation time of path based fingerprints in the CDK is currently (painfully) slow. Building the index is done in memory, since 1,000,000x1024 bit fingerprints is only 122 MiB you can easily build indexes with less than 10 million on modern hardware. During index searching the entire index is memory mapped, setting the chunks system property (see the GitHub readme) will avoid this at a slight performance cost. Results return the id in the index (indirection) and to get the original Id one would need to resolve it with another file (generated by mkidx). Index update operations are not supported without rebuilding it. These are all pretty trivial to resolve and I've simply omitted them due to time. With that done, here's a quick synopsis of making the index, there is more in the GitHub readme. The fpsscan does a linear search computing all Tanimoto's and outputting the lines that are above a certain threshold. The simmer and toper utils use the index, they either filter for similarity or the top k results. They can take multiple SMILES via the command line or from a file. Using the same queries from the MongoDB search I get the following distribution of search times for different thresholds. Some median search times are as follows. 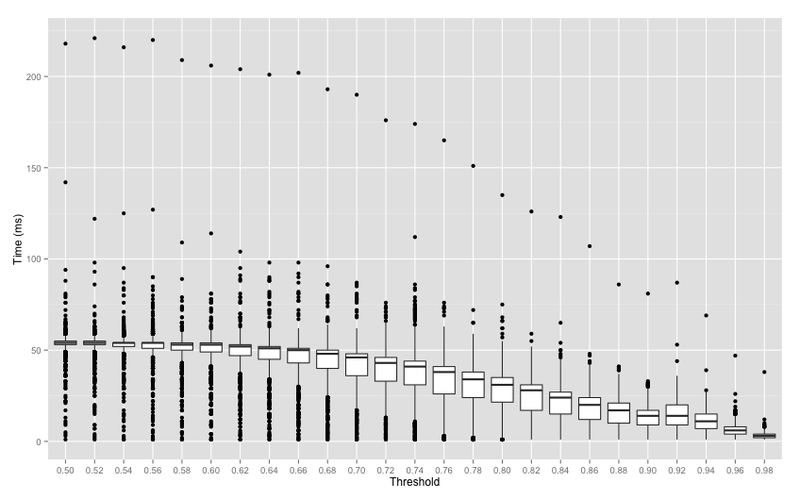 In the box plot above the same (first) query is always the slowest, this is likely due to JIT. It's interesting to see that the times seem to flatten out. By plotting how many fingerprints the search had to check we observe that below a certain threshold we are essentially checking the entire dataset. The reason for this is potentially due to the sparse circular fingerprints. Examining the result file (see the github README) we can estimate that on average we're calculating 23,556,103 Tanimoto's a second. This also means that retrieving the top k queries isn't bad either. 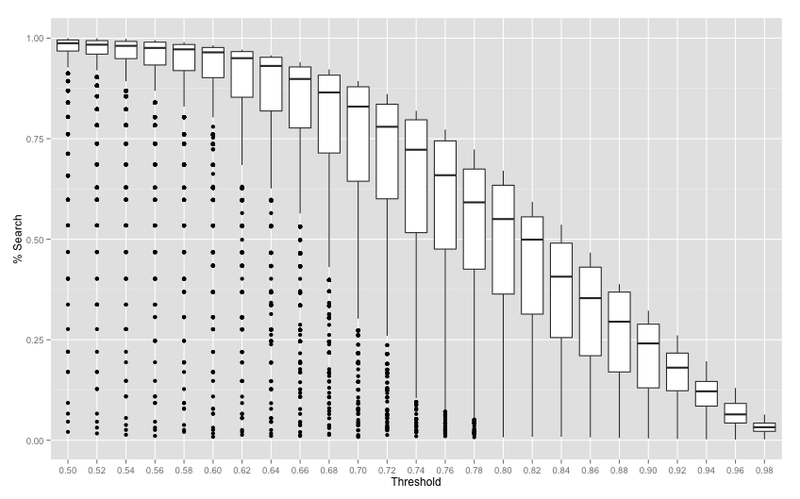 For example 10,000 gives a median time (Code 3) of 72 ms.
Next I'll look at some like-for-like comparisons. The latest release of the CDK (1.5.8) includes a new generator for rendering structure diagrams. A detailed introduction to configuring the new generator is available on the CDK wiki. The new generator can be used as a drop in replacement in existing code. However, one aspect of rendering that I've struggled with previously was getting good sized depictions with the CDK - most notably with vector graphic output. This post will look at how we can size depictions and will provide code in an example project as a reference. ChEBI's current entity of the month - maytansine [CHEBI:6701] will be used to demonstrate the sizing. Three parameters that are important in the overall sizing of depictions. These are the BondLength, Scale, and Zoom which are all registered as BasicSceneGenerator parameters. The Zoom is not needed if we allow our diagram to be fitted automatically. The BondLength can be set by the user and has a default value of '40' whilst the Scale is set during diagram generation. BondLength units are arbitrary - for now we'll consider this as '40 px'. The Scale parameter is used to render molecules with different coordinate systems consistently[2,3]. The value is determined using the BondLength parameter and the bond length in the molecule. For maytansine [CHEBI:6701] the median bond length is ~0.82. Again, the units are arbitrary - this could be Angstroms (it isn't). The Scale is therefore the ratio of the measured bond length (0.82) to the desired bond length (40 px). For this example, the scale is 48.48. The coordinates must be scaled by ~4800% such that each bond is drawn as 40 px long. Now we know our scale (~48.48), how big is our depiction going to be? It depends how we measure it. One way would be to check the bounding box that contains all atom coordinates (using GeometryUtil.getMinMax()). However, this does not consider the positions of adjuncts and would lead to parts of the diagram being cut off. Fortunately the new generator provides a Bounds rendering element allowing us to determine the true diagrams bounds of 8.46x8.03. Since the scale is ~48.48 the final size of the depiction would be ~410x390 px. A margin is also added. Now we have the size of our diagram we can render raster images. Unfortunately the current rendering API makes this a little tricky as the diagram is generated after the desired image size is provided by the user. To get the correct size we need to generate the diagram twice (to get the bounds) or use an intermediate representation (we'll see this later). Rectangle2D bounds = ...; // need the bounds here! To render scalable graphics we can use the VectorGraphics2D implementations of the Java Graphics2D class. Vector graphics output can use varied units (e.g. pt, mm, px) - the VectorGraphics2D uses mm. Without adjusting our scaling the render of maytansine [CHEBI:6701] would be displayed with bond lengths of 40 mm and a total size of ~410x390 mm. The output can be rescaled after rendering but the default width of 41 cm is a bit large. We therefore need to change our desired bond length. The bond length of published structure diagrams varies between journals. A common and recommended style for wikipedia  is 'ACS 1996' - the style has a bond length of '5.08 mm'. Although setting the BondLength parameter to '5.08' would work, other parameters would need adjusting such as Font size (which is provided in pt!). To render the diagram with the same proportions as the raster image we can instead resize the bounds and fit the diagram to this. Since the desired bond length is '5.08 mm' instead of '40 mm' we need rescale the diagram by 12.7 %. Our final diagram size is then ~52x50 mm. The border for ACS 1996 is '0.56 mm' which can be added to the diagram size. To help demonstrate the above rendering I've put together a quick GitHub project johnmay/efficient-bits/scaled-renders. The code provides a convenient API and a command line utility for generating images. The command line utility provides several options to play with and can load from molfile, SMILES, InChI, or name (using OPSIN). 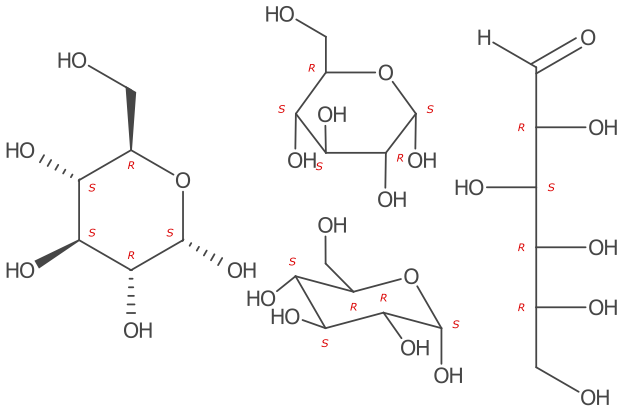 $: render -Dexec.args="-name porphyrin -pdf"
$: render -Dexec.args="-name porphyrin -pdf -sma n1cccc1"
$: render -Dexec.args="-name porphyrin -pdf -atom-numbers"
$: render -Dexec.args="-name '(2R)-butan-2-ol' -pdf -cip-labels"
$: render -Dexec.args="-smi CCO -pdf ethanol.pdf -svg ethanol.svg"
$: render -Dexec.args="-mol ChEBI_6701.mol -pdf chebi-6701.pdf"
$: render -Dexec.args="-name 'caffeine' -svg cc-caffeine.svg -font-family 'Cinnamon Cake' -stroke-scale 0.6 -kekule"
CDK 1.5.8 has been released and is available from sourceforge (download here) and the EBI maven repo (XML 1). The release notes (1.5.8-Release-Notes) summarise and detail the changes. At 13 years and 4 months the Chemistry Development Kit (CDK) is reasonably mature for a software project. Over the years there have been many changes in development practices as the code base evolved. This post is a departure for the usual algorithms and performance tests and looks at a recent and major change in the CDK development process. On Monday, Egon, Nina and I made the final alterations that changed the build system from Ant to Maven. This change has been in the works for a long time and has been suggested multiple times. The actually migration has taken about a years worth of planning. If you want to have a play with the new build system yourself I've put together a brief guide that also describes how to import the project into several popular IDEs - Building CDK. The project README also summarises the command line usage. I download CDK releases and use it my project, what has changed? If you are using the CDK as a dependancy you should not notice any difference. The library and bundled dependencies will still be distributed at each release. If you are also using maven then CDK module artefacts have been deployed for last few releases. These are by far the easiest way to use the library as dependency versioning is managed maven and newer releases can be automatically downloaded. Please see the project README for repository details. I build the CDK source and use it my project, what has changed? The source code is now built with maven - the README summarises the steps. As with releases, SNAPSHOT artefacts will be deployed to a remote repository (currently EBI). I have modifications to the CDK that I apply, what has changed? If your patches are Git commits then these can still be applied. Git will sort out and use the correct file locations to any modified files. If the patch creates new files these will need to be moved manually to the correct location. Prior to Monday the project code was organised under a single root folder. The Ant build would then read instructions in the source code and assemble the modules during compilation. This approach allowed progressive partition the code into modules over an extended period. Without this system we would not have be able to convert to maven at all. This system was customised and specific to the CDK which, in my opinion, made it a significant barrier to contributions. I know that personally I struggled to understand what was going on at compile time. A highly customised build process makes it not only difficult for a human to comprehend but also any automated tooling (Integrated Development Environments, IDEs). Superficial support has been provided for Eclipse and Netbeans editors but neither correctly interrupted the modules and relationships between them. The most noticeable difference in the project is each module now has a separate source tree. This allows easier reasoning about the contents of module and provides a visual cue about the modular structure. 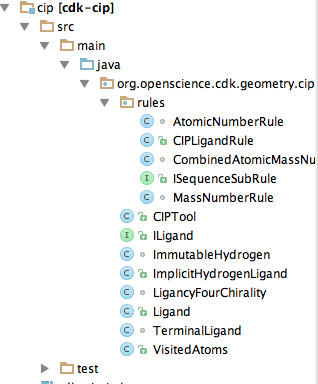 Below we can see the 'cip' (Cahn-Ingold-Prelog) module source tree only contains the classes relevant to the module. Separate source trees are not specific to maven and we could still use Ant. The main benefit is that Maven supports and encourages this kind of structuring by default. There is still more work to do on the module organisation, for example, CMLWritier is the the 'libiocml' module whilst the CMLReader is the 'io' module. The modules are mainly organised by their dependancies but in future it may be beneficial to organise by function. 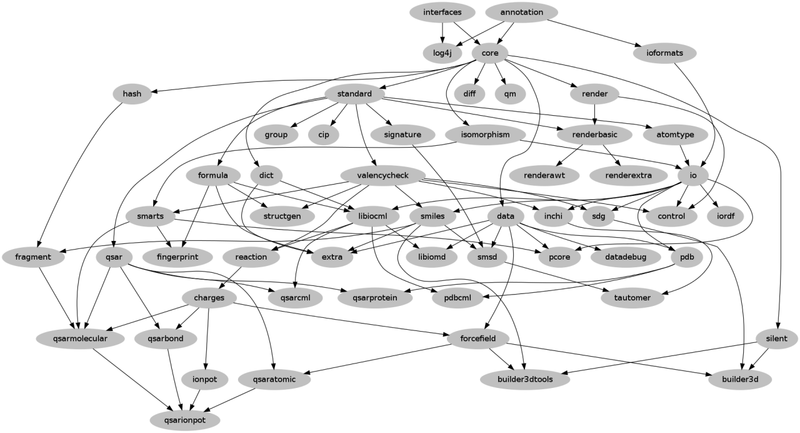 Normally classes with similar dependencies have similar function but this isn't always the case. An example of this is seen with the LINGOFingerprinter and SignatureFingerprinter in the 'smiles' and 'signatures' modules rather than the 'fingerprint' module. The Maven build also allows us to define groupings of the existing modules. These intermediate modules group the code base in a few digestible sections. You can see these groupings at the root level in the repository - https://github.com/cdk/cdk/. There are five groups and an additional misc/ module for the left overs. I'm planning to write a more in depth guide for the wiki but here is a quick overview of what is present in each. descriptor/ - fingerprinters, qsars and signatures for describing and characterising attributes of a compound.